In September, Adonia Dale joined Eskolta as our first ever Transfer School Alumni Fellow, a one-year office position created specifically for recent transfer school graduates to gain experience in the workplace. 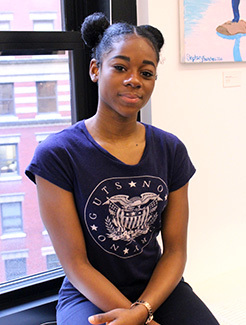 Adonia is a recent graduate of Metropolitan Diploma Plus (Metro) in Brooklyn who enjoys singing, dancing, and spending time with kids. She hopes to become an elementary school teacher one day. We sat down with her to hear what attending a transfer school meant for her. What made Metro different from your previous high school? AD: Every student had their own counselor, and whoever our counselor was, they were responsible for us. They made sure we were coming to class on time; if we didn’t, they would call our houses. They stayed on top of us because they knew going to a transfer school was a second chance for us, so they wanted to make sure that we actually graduate. Because where would we go after that? Being at my regular high school—it was bigger, they didn’t care so much. Was there a person or a class at Metro that helped you the most? AD: My global/U.S. history class with Mr. Toussaint. Even though he wasn’t my counselor, he pushed me. That was my worst class, but the motivation and the help I got, it made me pass. And I was taking that class since my first high school! Also definitely my counselors Miss Wendy and Miss Rivera. They pushed us to do better. They were my second moms. What is one skill you learned at Metro that you find yourself using in your job at Eskolta? AD: Being humble. I learned how to sit down and try to put things together and do assignments at a certain time. I have to be humble here because a lot of things are getting thrown at me and instead of losing my mind, I have to remember to be humble and ask questions if I’m confused. What is a new skill you’ve acquired here? AD: Asking questions—I never asked so many questions in my life! Also being organized—I thought I was organized before, but this taught me how to really be organized. How has the way you think about transfer schools changed? AD: Honestly, I always thought of transfer schools as for kids that were lazy. But they’re not. Meeting those kids at the [Eskolta Transfer School Student] Art Gala, you can tell they are very talented. And transfer schools basically bring out their talent. At what point in school did you feel like your opinion about transfer schools was changing? When did you feel most connected with your school? What caused those feelings? AD: Basketball games. At every game, even if it was away, we had our counselors there. Half the school was there. Teachers were there. To win and have your teachers come up to you and say, “You know, you are amazing. I knew you could do it,”—not even to just me, but to all of us—it’s amazing. Not a lot of cities have schools like transfer schools—but many are interested in starting them. What do you think the outside world should know about the value of transfer schools? AD: As a transfer school, you can’t be quick to give up on a student because they’re not coming all the time or because they got in a fight this day or because they feel like they cannot pass a class. Other than a transfer school, where else can they go? If you want to start a transfer school, you have to think about our flaws. If [some] situation is bugging a student, they are not going to pass that class, they are not going to feel like coming to school. You have to be their friend before you’re their teacher.